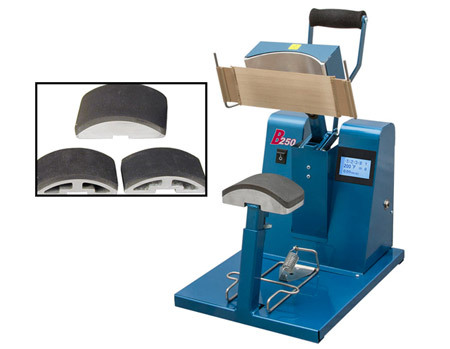 Home > Cap Press Machines - Manual, Auto-Open & Air-Automatic > Hix B-250D Cap Press, Includes Golf, Ball & Youth Platens! Includes Golf, Ball & Youth Platens! Digital timer is adjustable up to 999 seconds, shows time countdown on readout, beeps after elapsed time, and resets when handle is raised. Calibrated digital temperature control is adjustable up to 450°F (232°C) and displays the current temperature. Sturdy design that is lightweight and portable. Easy to open and close handle with full range pressure adjustment. Press opens a full 70° for easy placement of products. Turn caps into walking advertising for your customers, teams, and more!